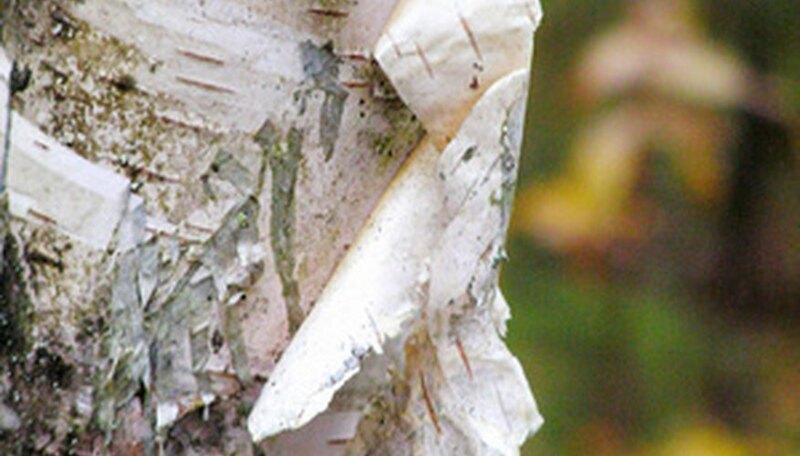 Birch trees are prized for their mottled, gray or creamy bark, which peels in some species. The leaves of the tree are small, and the branches are graceful, making the entire tree a very attractive package. These trees are as delicate as they look, often succumbing to diseases or insect pests. Bugs that eat birch tree leaves are the least dangerous to the tree, as they only damage the leaves and do not kill the tree itself. The birch leafminer is found on all species of birch trees. A widespread insect pest, the birch leafminer munches on the tender middle part of the tree's leaves, causing it to turn brown, shrivel up and drop prematurely from the tree. Birch leafminers rarely kill a tree, but they can defoliate almost half of a birch if the infestation is heavy. Such defoliation will cause the tree great stress, and while birch leafminers do not kill birch trees, they create stress on the tree, weakening it and making it susceptible to the more dangerous bronze birch borer, which does not eat the leaves of the tree but instead attacks the sapwood. Birch leafminers appear as small, white worms and overwinter in the soil--often riding to the ground on dropped leaves--and rise in the fall to attack the tree. Birch leafminers can be killed with the application of a preventative insecticide in the spring. Aphids are very common insect pests that will swarm over and devour the leaves of all types of birch trees. The aphids usually hide on the underside of the leaves and use their sucking mouthpieces to drain the sap from the tender green foliage. This causes the leaves to twist, shrivel, turn yellow or otherwise deform. Aphids can be killed with the application of an insecticide. These distinctive, black caterpillars are easy to spot. Adults have a blue band on each side, and they usually cluster in groups on the tree. Forest tent caterpillars do not create web tents, unlike their name implies. They do, however, devour the leaves of many types of trees, and birch trees are one of their favorites. In some cases, the tree will re-leaf after defoliation after the bugs have ceased to feed. Kill forest tent caterpillars can be killed with the application of a general insecticide. Spittle bugs, like aphids, feed on the sap of the leaves of the birch tree. The damage these bugs do is minor, although unattractive. The leaves may drop prematurely from the tree, turn brown, turn yellow, shrivel up or become otherwise malformed. Spittle bugs are easy to spot because they cover themselves with a protective layer of foamy spittle. They can be killed with the application of an insecticide if the infestation is severe.